Dr. Andrea Gray MD, PC specializes in complete medical, surgical and routine eye care in Roseburg, Oregon. Eye care is important to everyone because eye conditions and disease that can destroy your and your family’s healthy vision can strike at any time in life, from newborn to old age. Protecting your eyes from accidents and early detection and treatment of eye problems are the best ways to keep your healthy vision throughout life. If you or your family are at risk for eye disease or experience any eye problems, visit Dr. Gray right away. 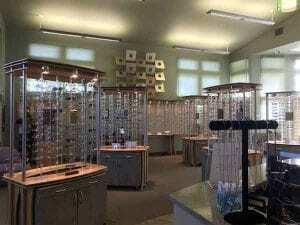 We also feature a full service optical shop, featuring over 1800 frames to choose from, available in all price ranges. We also offer contact lenses. Read below about the services we offer, and call us today to schedule your appointment. We offer comprehensive eye exams performed by board certified MDs specializing in ophthalmology. Our thorough vision exam includes glaucoma testing and checks the health of your eyes. In the case that you need to be fitted with eyeglasses or contact lenses, our practice utilizes the latest technology and treatments available. Schedule your comprehensive eye exam today! Inside our eyes, we have a natural lens. The lens bends light rays that come into the eye to help us see. The lens should be clear. If you have a cataract, your lens has become cloudy. It is like looking through a foggy or dusty car windshield. Things look blurry, hazy or less colorful with a cataract. As frightening as cataracts might sound, modern cataract surgery usually can restore vision lost to cataracts – and often can reduce your dependence on eyeglasses as well. An intraocular lens (IOL) is a clear, artificial lens implant used to replace a cloudy natural lens in cataract surgery. Like your eye's natural lens, an IOL focuses light that comes into your eye through the cornea and pupil onto the retina, the sensitive tissue at the back of the eye that relays images through the optic nerve to the brain. Most IOLs are made of a flexible, foldable material and are about one-third of the size of a dime. Like the lenses of prescription eyeglasses, your IOL will contain the appropriate prescription to give you the best vision possible. Dr. Gray performs Cosmetic Botox for the lines between the brow and forehead. Contact us for more information. While small amounts of excess skin may be a cosmetic problem, large amounts of skin may impair the vision by getting in the way. Patients with this problem find themselves having to raise their eyebrows in order to see. When vision is significantly impaired by excess eyelid skin, medical insurance may cover an eyelid lift surgery (blepharoplasty). Strabismus is a visual problem in which the eyes are not aligned properly and point in different directions. One eye may look straight ahead, while the other eye turns inward, outward, upward or downward. The eye turn may be consistent, or it may come and go. Which eye is straight and which is misaligned, may switch or alternate. Entropion is the inversion of an eyelid that is caused by age-related tissue relaxation, post infectious changes, post traumatic changes or blepharospasm. Eyelashes rub against the eyeball and may lead to corneal ulceration and scarring. Symptoms can include foreign body sensation, tearing and red eye. Diagnosis is clinical. Definitive treatment is surgery. Ectropion is eversion of the lower eyelid that is cause by age-related tissue relaxation, cranial nerve VII palsy and post traumatic or post-surgical changes. Symptoms are tearing, due to poor drainage of tears through the nasolacrimal system, which may no longer contact the eyeball, and symptoms of dry eyes. Diagnosis is clinical. Symptomatic treatment can include tear supplements and, at night, ocular lubricants. Definitive treatment is surgery. When to See an Eye M.D.